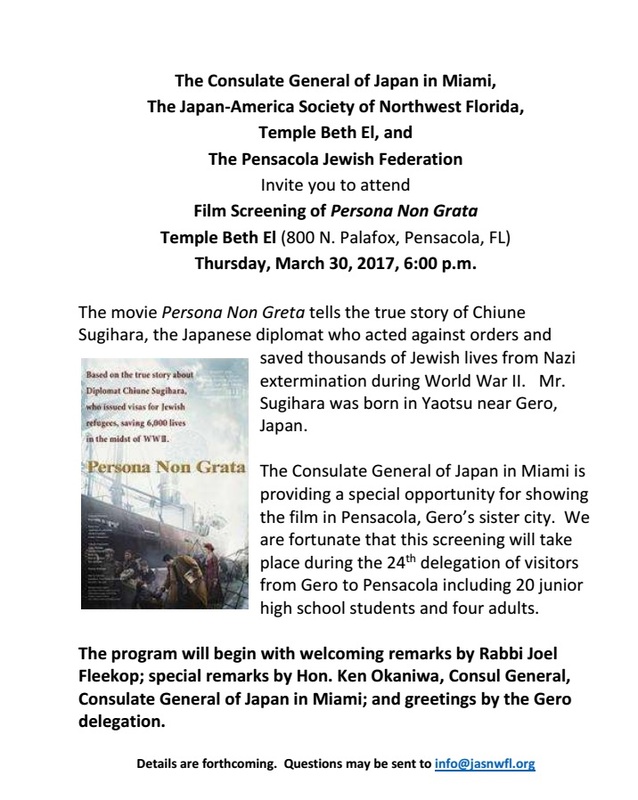 The Consulate General of Japan in Miami, The Japan-America Society of North West Florida, Temple Beth El and The Pensacola Jewish Federation invite you to attend the film screening Persona Non Grata at Temple Beth El (800 N Palafox, Pensacola, FL) on Tuesday, March 30, 2017 at 6:00pm. The movie Persona Non Grata tells the true story of Chiune Sugihara, the Japanese diplomat who acted against orders and saved thousands of Jewish lives from Nazi extermination during World War II. Mr. Sugihara was born in Yaotsu near Gero, Japan. And because Pensacola is Gero’s sister city, The Consulate General of Japan in Miami is providing this special opportunity for showing the film in Pensacola! We are fortunate that this screening will take place during the 24th delegation of visitors from Gero to Pensacola including 20 junior high school students and four adults.